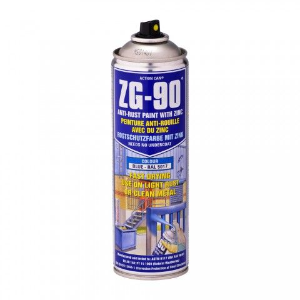 ZG-90 Colour matched to newly galvanised metal. High zinc content. ZG-90 Colour matched to newly galvanised metal. High zinc content. Supplied with a jet spray and a cone spray. Requires no undercoat or top coat. Meets standards ASTMB 117 hot salt spray, BS AU 148:PT 14 (1969) natural weathering, and DIN EN ISO 12944-1 corrosion protection of steel structures. Showerproof in 15mins. Cans printed in English, French and german suitable for supply in the EU. Size: 500ml.